Fresh, calm and alert, as irresistible a tonic to the senses as a walk in green woodland. Here is distilled essence of natural life, with fern and oakmoss. City rigours zappped - instantly! Made in England. Size: 100 ml / 3.4 fl oz natural spray. Foug?re (eng: fern) is one of the mainstays of fragrance, one of the most important families in the olfactory genealogy. 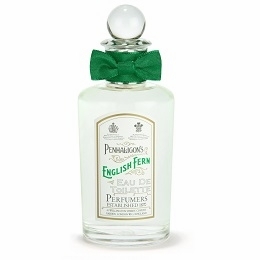 Penhaligon?s, are proud to introduce English Fern. It is 1910! This is a fragrance that has one (naked) foot in the bathroom. A washed-clean soaped skin, a deeply satisfying odour of which one never bores?. damp skin after a steam bath demands such a perfume. A tonic so fresh it?s almost cold.